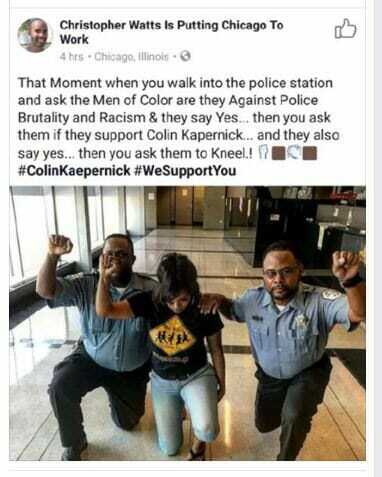 Chicago police take a knee against themselves – pose with black power fist raised. Two black police officers were pictured in Chicago on one knee. Instagram Barbie Englewood Barbie posted the photo on Instagram with a caption. She believes the lies that Mike Brown was an innocent youth shot in cold blood with his hands up. Don’t be Afraid to be Controversial.. I will stand behind them! Go Bother the killers of Sandra Bland, Michael Brown, Tamar Rice, Trayvon Martin,Philando Castile and the list goes on and on.. these men did a Noble thing! They let me know that even in uniform they’re against Police Brutality & Racism! They took a Kneel for Us when nobody else would that looked like them! This entire narrative is based on lies. Don't be Afraid to be Controversial.. I will stand behind them! Go Bother the killers of Sandra Bland, Michael Brown, Tamar Rice, Trayvon Martin,Philando Castile and the list goes on and on.. these men did a Noble thing! They let me know that even in uniform they're against Police Brutality & Racism! They took a Kneel for Us when nobody else would that looked like them!